Swizzle never recovered from her initial illness. Her problem may have been of genetic origin, compounded by years of a bad diet. We lost her too soon. Sometimes you know there is a story behind a bird, but the bird cannot tell us what the story is about. Little Swizzle was such a bird: She was found in a cage full of toys, covered in a warm blanket, and left under a stairway in an apartment complex. She was a very tame, friendly little budgie who jumps willingly on a proffered finger. Why was she left outside on a cold winter night, all by herself? 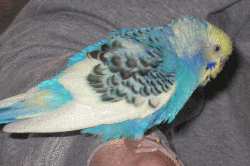 Somebody loved this little budgie once, but we`ll never know what happened.